This appeared in Oyster Magazine. Written by Andrew Levins. The Cheese Burger at Rosamunde Sausage Grill, Lower Haight, San Francisco, CA. At Rosamunde Sausage Grill the line starts forming early on Tuesday. 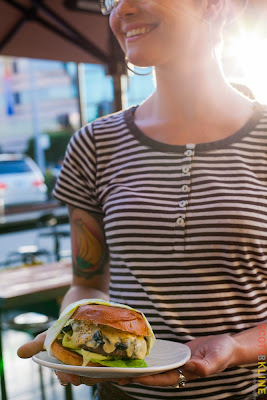 Only on that day does Rosamunde serve their legendary cheese burger. I got there just before they open at 11:30. There were about fifteen people in line. Many more came behind me. 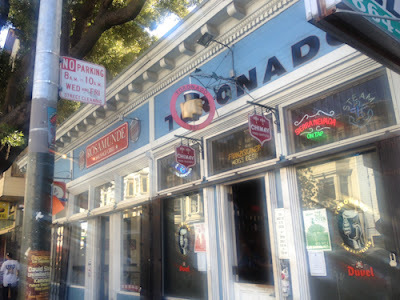 Rosamunde only serves 150 of their 8-ounce masterpiece, and only on this day. Legend has it that the original owner, Jeffrey felt that there were no good burgers in San Francisco. And even though he had quite a reputation for sausage, he felt the void must be filled. 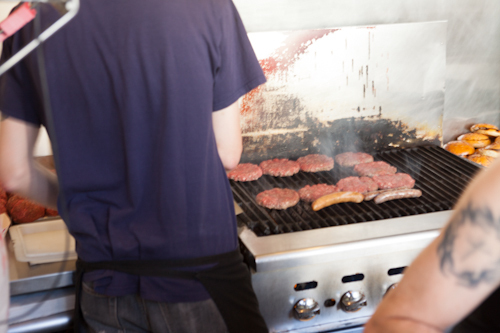 So once per week, for the past eight years, the place fires up the charcoal grill for burgers. The burger itself is quite a deal at $6. It comes with 8 ounces of loosely packed, fresh ground chuck from Weber Quality Meats. The burger comes with cheddar cheese, green leaf lettuce, tomato slice, grilled onions, pickle slices, mustard and ketchup. It is all served on a nicely toasted onion bun. 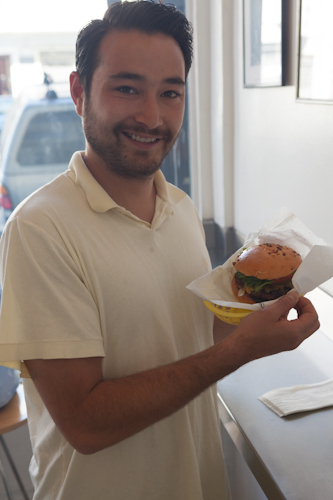 Brian Berger after finishing off his burger, Rosamunde Sausage Grill, San Francisco, CA. I waited my turn at the counter and Charlie took my order. I must say that I was one of the few people that Charlie did not already know by name. He patiently answered my tedious questions in between patrons. He told me it would be about 25 minutes. He didn’t take my money. That happened later when my burger was ready. 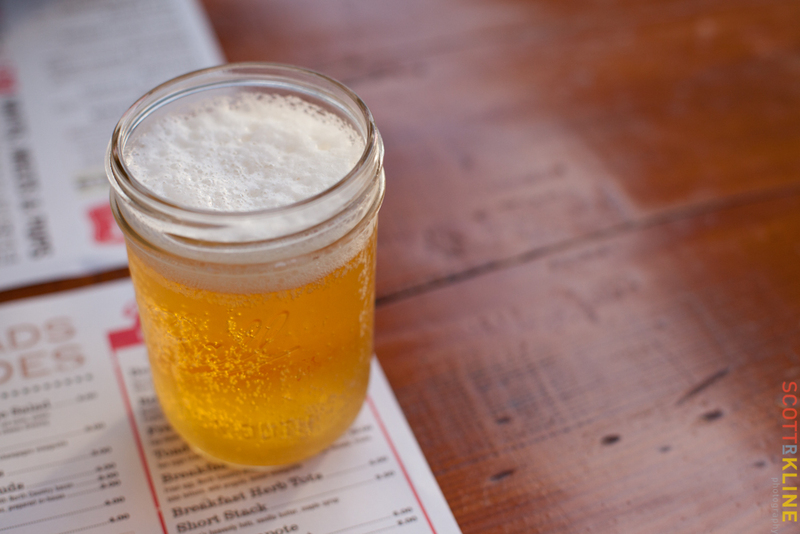 Many people who ordered headed next door to Tornado, a beer bar, where they eat their burger. Jeff Berger with his namesake. While I waited, I chatted up the man next to me. Turns out his name is Jeff Berger. 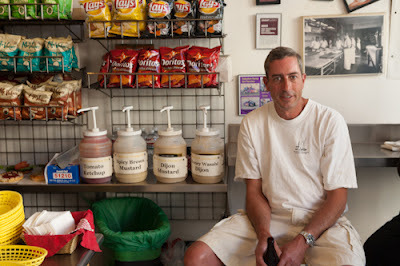 As we were talking about his favorite SF burger (Corner Store), another fellow walked up who had overheard us. His name – Brian Berger. I know he was telling the truth, his truck for Berger Design Build, was parked right outside. Exactly 25 minutes after I had ordered, my name was called. 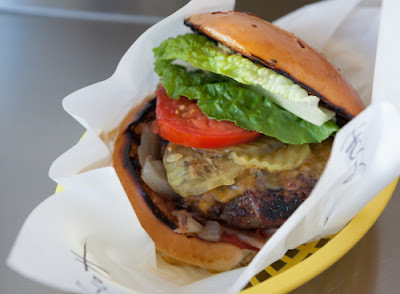 The burger is served on white paper in a yellow basket. It is an impressive stack with everything looking fresh and tall. They first bite revealed a perfectly cooked medium burger with moist and tasty meat. It was not heavily seasoned, maybe a little salt and pepper, but it was very tasty. The cheese was melted just right. All the vegetables were fresh and crisp. I liked the mix of ketchup and mustard, a classic. The only beef I have with the burger is that the bun fell apart a little on the bottom under all the weight and juice. The cultural experience of eating here was fantastic. There were so many regulars. It must be like a weekly reunion for Charlie, who politely declined to have his photo taken. I will become a regular myself. Rosamunde and its neighborly bar, Tornado, where you can eat your burger. All photos by Scott R. Kline on October 2, 2012 at Rosamunde Sausage Grill, San Francisco, CA. At Hopdoddy in Austin, TX, the line to get into the restaurant and so you could get in line again was 15 deep at 6:45 on a 95 degree Tuesday evening. And it didn’t move fast A diverse crew of vacationing families with kids, tattooed muscle-bound twenty-somethings, and every other demographic you can think of waited patiently for their burger fix. Jack White's latest song blared from the speakers, so either Hopdaddy is pretty hip or Jack White is not. 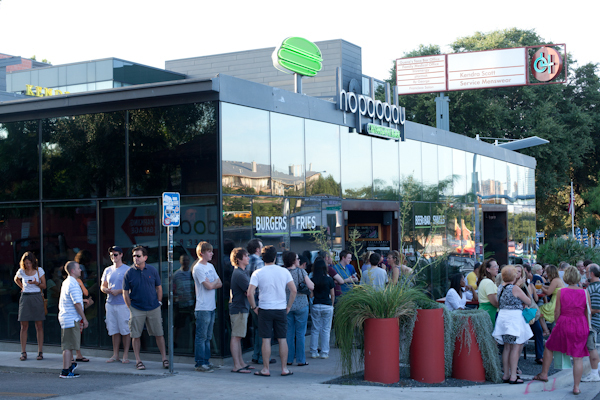 Living up to its name, Hopdaddy features local microbrews. I had a Live Oak Pilz ($5) while I waited. After 30 minutes, I made it to the front to order. I ordered the Classic Burger with Bacon and Cheese ($7.50). It comes with hormone free, antibiotic free, all-natural angus beef, red leaf lettuce, white onion, beefsteak tomato and sassy sauce in addition to “classic” cheese and bacon (without the bacon and cheese the burger is $5.50). Kennebec fries are $2.25 more. 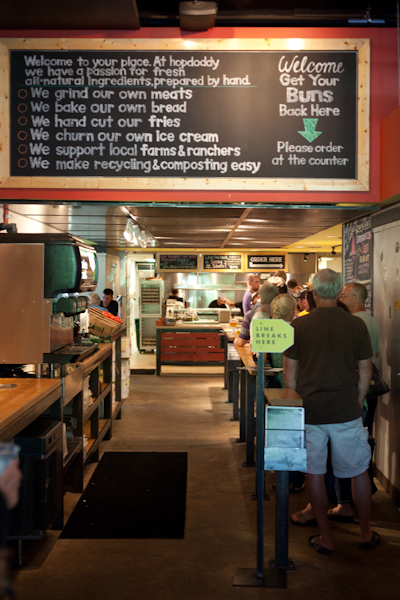 The menu noted that the buns are baked on site and the fries are fresh cut. A young lady with butterfly wings tattooed on her back led me to my table marked with a 3, where I waited for my repast. While I waited, I surveyed the restaurant. Butcher block tables surrounded with green plastic and steel chairs sat on a concrete floor giving the place a modern feel. Another 10 minutes and the burger arrived on a metal baking tray. I went and fetched some chipotle ketchup for my fries. (highly recommended) The toasted bun fit the burger perfectly. 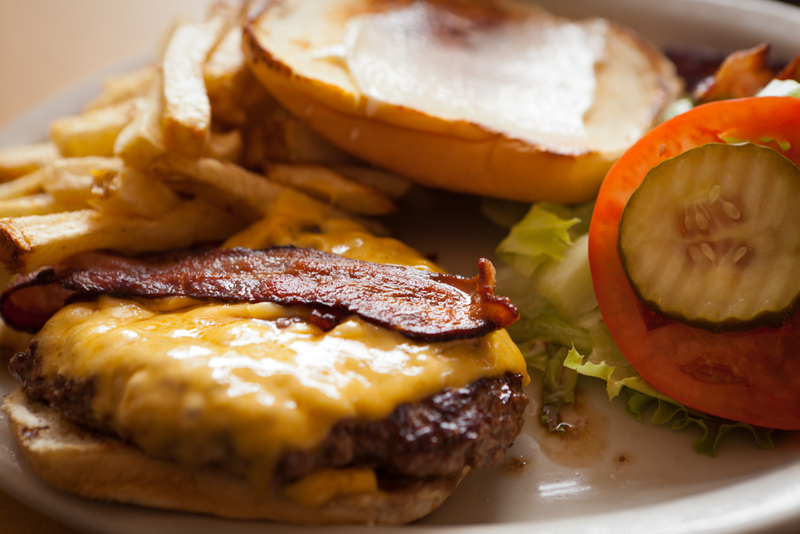 Yellow cheese was melted on top of the patty, which sat on very fresh onion, tomato and lettuce. The sassy sauce was a mildly spicy mayonnaise-based sauce that tasted slightly of mustard. The burger squirted juice and was cooked a perfect medium as ordered. The beef was tasty and mildly seasoned. The bacon was crisp and yummy. Fries were very crispy and fresh: the thin side off medium with skins on, they sported parsley, salt and pepper. Overall, despite the long wait, the burger and fries were worth it. The beer was cold and tasty. Everyone was in a good mood, including me. Bill's Place in San Francisco's Outer Richmond has been around 53 years. According to the menu, Don the owner, took over from the original owner, Bill and then Bill's wife and has been with the place for 43 years. the place has the feel of a local fixture. 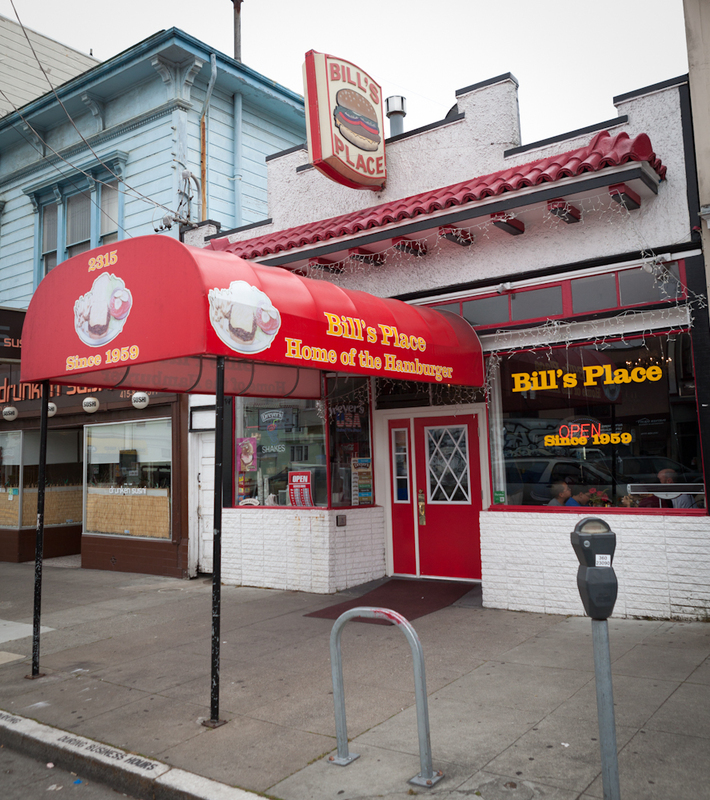 The bright red awning proclaims, "Bill's Place - Home of the Hamburger" and indeed it is. 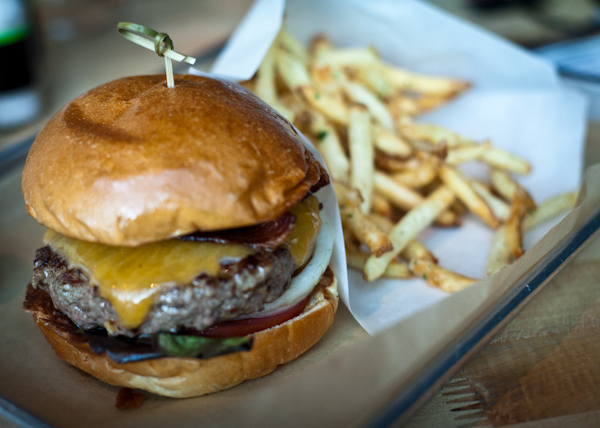 The menu has countless burger combos named after local celebrities and local teams the Giants and 49ers. I ordered ordered the Bill's Cheeseburger #01 for $9 including fries. 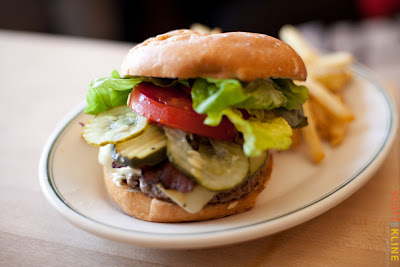 The burger is a 1/3 pound burger made of fresh fresh chuck ground at the restaurant, always a good sign. The also have a #2 at 3/4 pound and a #3. My wife ordered a bacon cheeseburger. My daughter a chili cheese dog. 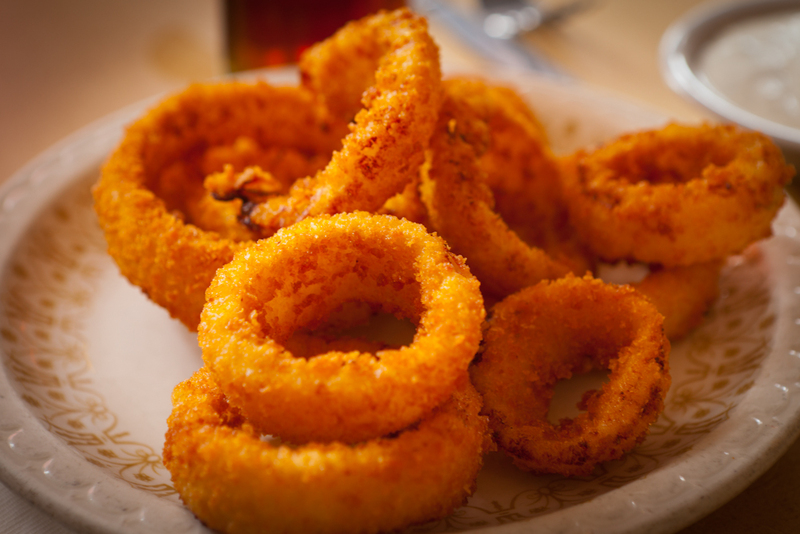 We grabbed an order of onion rings for $3.95. The onion rings arrived almost instantly, hot crunchy and sweet. They are big and thick and taste great dunked in ranch dressing. It seems like one bite later the rest of the food arrived. I will admit it curious that the #01 comes with only one strip of bacon. The Bacon cheeseburger has three. The bacon was crisp, salty and just the right thickness. The American cheese was nicely melted. 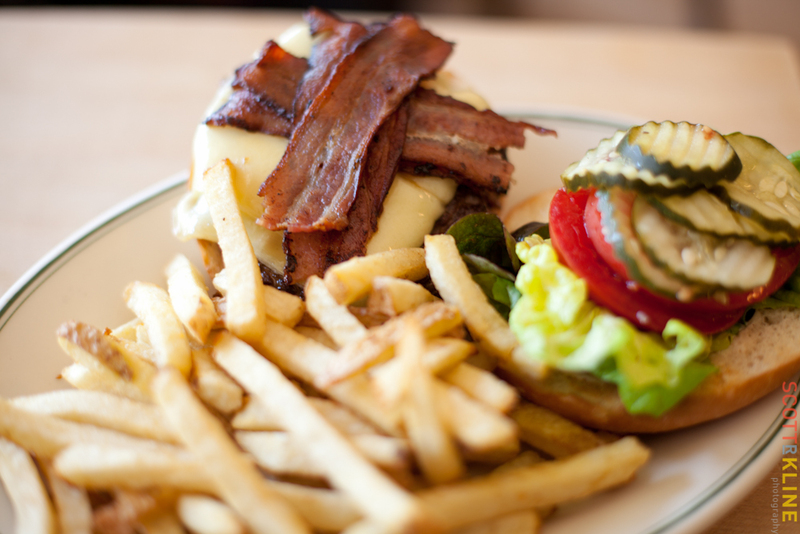 The burger is served open-faced with the tomato slice, pickle chips and pile of green-leaf lettuce on the side. The sesame bun was nicely toasted and had a smear of mayo. A big pile of fresh cut fries rode shotgun on the plate. I found the burger cooked a perfect pink and juicy medium. The meat is flavorful, if minimally spiced. The whole concoction very enjoyable. The fries were a little soggy as fresh-cut fries often are, but they were hot and cooked correctly. They were not greasy at all. We really enjoyed the ambiance of the place. Lively, full of people of all ages and colors. Everything is a little worn down and tired, looking all of its 53 years, but the place has a friendly, lived-in feel. The couple sitting next to me joked they had been coming there for 85 years, even though it has only been open 53. Same age as me, as a matter of fact. Just For You Cafe in the Dogpatch Neighborhood of San Francisco, sits about two blocks from where I now live. 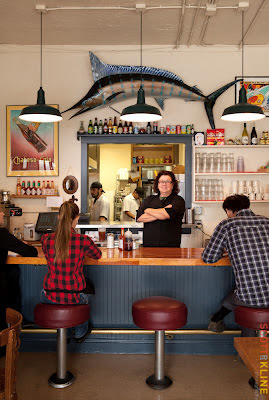 Their food is all fresh and local and is served with the Louisiana influence of owner Arienne Landry. I love their fish tacos and their tuna melt, but I had never reviewed their burger. Until today. Saturday is generally a busy day at Just For You. They are a very popular place for breakfast and they have a brunch menu on Saturdays and Sundays. I went late and avoided the wait. Stephanie was in charge today and she always takes great care of me and the rest of the hoards. As always the entire staff was friendly and prompt. Owner Arienne Landry behind the counter at J4U. I ordered the Bacon Cheeseburger ($10.50). Even though they don't have gruyere on the menu, they always have it, so that is what I asked for. I also added fries ($2.50). The burger comes piled high with tons of fresh vegetables. Green leaf lettuce, tomato slices and pickle slices are piled on the nicely toasted Acme white bun. Mayo was liberally applied. 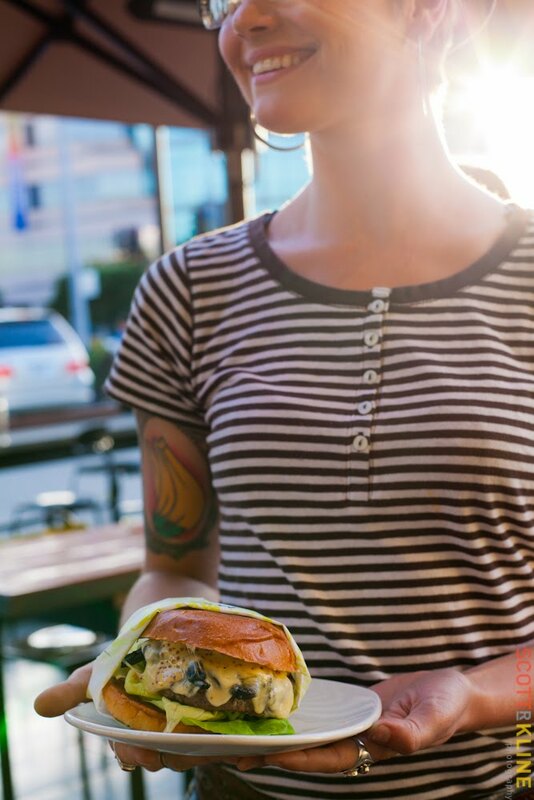 The seven-ounce patty is made from fresh ground natural beef. Even though they swore they don't add any salt and pepper to the beef, it has a nice flavor as if they did. The burger was cooked a nice medium as ordered. If I had to find a fault, it was not quite as juicy as I like. The bacon was salty and thick on top of the gruyere which was nicely melted. The bun is spongy but tough enough not to fall apart under the stress of all it holds. The fries are amazing. Fresh cut, they sport skins and medium thickness. They aren't soggy like some fresh-cuts (Hello In-N-Out). Stephanie told me they fry them twice. The first time gets them part way there. Then they are drained and fried again right before serving to get that crisp finish. The great thing about having a burger here is all the other food your lunch partner can choose if they don't like burgers. Finish off your meal with the great beignets. Short order in Los Angeles sits in the area at Third and Fairfax Original Farmer's Market, which is really a bunch of permanent food installations. The burger stand sits out in the open air. We were there on a lovely February Saturday and enjoyed the warm winter L.A. air. I ordered the Short Order Burger ($12) with Grass Fed Beef from Magruder Ranch. It comes with morbier cheese, griddled mushrooms, bibb lettuce and mustardy-mayo. I added bacon as well. We ordered the Short Order Spuds with sour cream dipping sauce with North Country Bacon ($6) rather than fries. We chatted up our charming server, finding out about the neighborhood and admiring her tattoos. She was as relaxed and charming as the setting. Everyone was friendly and chatty and we felt at peace with the world. I had a beer as Pat and I chatted up our nearby patrons. The burgers arrived along with the spuds. Wrapped neatly in yellow paper, they were a work of beefy art. The first bite did not disappoint. All the flavors blended so nicely wit the slightly spicy sauce. The beef had only the slightest pepper in it that really brought out the great taste of the juicy beef. The bun was firm and toasted perfectly. I must say, this is one of my favorite burgers in some time. The spuds reminded me of how much I used to like TGI Friday's potato skins. These are the gourmet version. Popping wth flavor along with the dipping sauce. Take a chill pill and visit Short Order, next time you are in L.A.